for the office, at home, for your wedding. 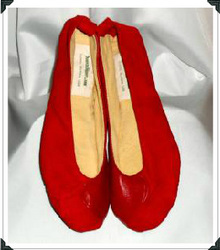 Our slippers are suitable for indoor or outdoor wear. 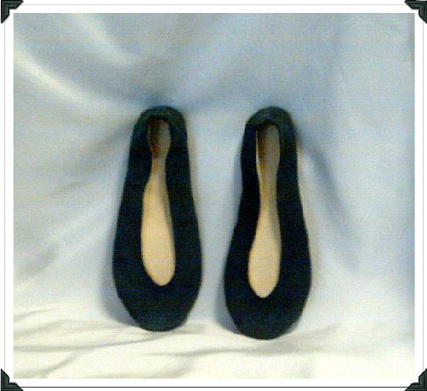 The basic ballet flat comes up over the toes about 4 inches. Choose from smooth leather upper, suede, pearlized leather or metallic finished leather. Select your durable cowhide sole in a sueded finish or lightly textured finish. 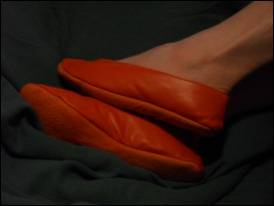 Leather tab at the back reinforces the back of the slipper. All orders custom made for you. Just a little toe cleavage in this style that comes up over the toes 2 inches. Back tab, choice of suede or slightly textured cowhide black leather sole and available in smooth leather, suede, pearlized and metallic finishes. 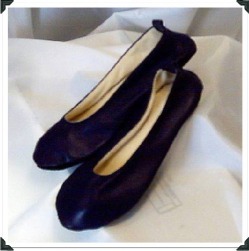 The soft lambskin leather is perfect for making soft pleats on the outside of the slipper, decorated with a leather bow. The upper comes up over the toes about 1 3/4 inches, leaving just a little toe cleavage. In smooth leather, suede, pearlized or metallic finish. Choose the finish for the black sole. This is an original design for Donovan Slippers. A customer suggested this extreme low cut style. This comes up over the toes only 1 3/4 inches for lots of toe cleavage. We did a pair with a suede strap, but this is not the regular offering. The style has a back tab, choices of textured or suede sole. Select smooth leather colors, suede, pearlized or metallic finish for the upper. 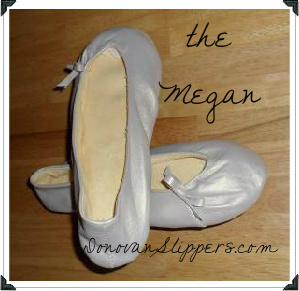 Original Design from Donovan Slippers. This cut is the basic - 4 inches over the toes. The design has a cut in shape of a "C". We have put together monochromatic color combinations in smooth leather and suede leather and some two color choices as well. All other features the same. his style is especially for lounging. Even for sleeping in bed to keep your feet warm. They are lighter than our regular slippers. The sole is the same light weight lambskin leather as the upper but turned to the back side of the skin which has a suede finish. The insole is a thin cotton batting to cushion the seams around the sole. They will not have the durable sole of our regular styles. Choose the style, Basic, Low Cut or the Riley and the smooth leather colors, suede or pearlized finishes.